What I am saying in other words, is that there are different methods to the goal of an efficient system that stewards the soil, harvests healthy crops, and does not over-tax the human labor. Of course in the first instance, everything depends on the goals of the farmer (in the context of his or her farm setup, soil type, climate, etc.) as to which methods are best suited to achieve the goal. What is the best way to get to your goals in terms of how you go about soil preparation, fertilizing, planting, cultivation, harvesting? Does it make sense to do it all by hand, with draft animals, a tractor, or perhaps a combination of all of these? 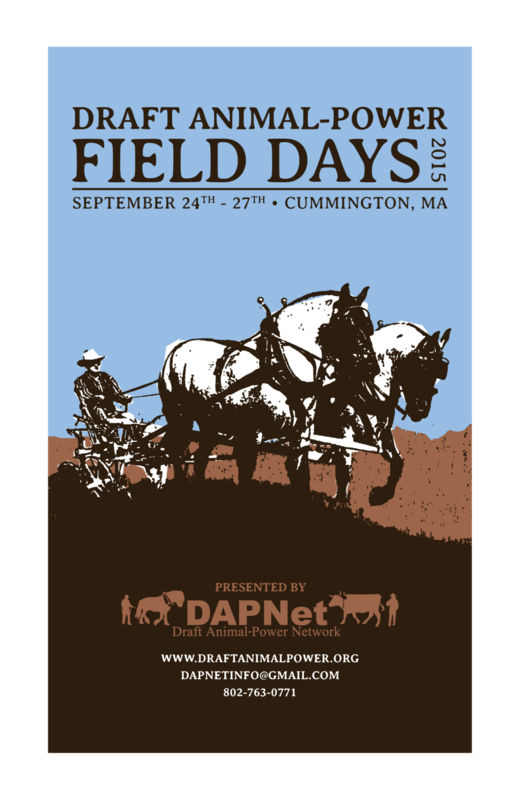 For a produce grower who makes their livelihood farming with horses, the principle reason to pursue the goal of using draft animal methods to grow crops and to make money is because it works better than working only by hand or with a tractor. What can a draft animal do better than can be done with hand work or a tractor? That should be our main criteria as a horse-powered produce grower. Second to that consideration is one’s love of working with horses (or other type of draft animal) which comes with other criteria and reasons. The origin of agriculture reaches back at least 12,000 years. We humans have been utilizing draft animal power for 8,000 years on this planet we call home. When comparing that history with percentages of how long the tractor has been “engaged” in the sphere of agriculture we see that the presence of tractors comprises a tiny percentage compared to that of the draft animal. For example, in my native land the Netherlands we have used the tractor for about 70 years now. In the Netherlands agriculture is thought to have been introduced around the year 4,000 B.C. Percentage wise the tractor is present just over 1.16% in our long history as farmers. When it is seen in a bigger context it puts our choices for power systems on our farms into a different perspective. As the current generation of new and young farmers face choices for which will be the optimal sources of traction on their farms I think it helps to give a view of the role of draft animal power from this longer deeper perspective. Modern mechanized agriculture impresses us with its massive scale and it is easy to forget what a recent development this is in the context of our whole human history. We modern people often lack an interest or curiosity about the way things were done in the past and we are prone to over-estimate the effectiveness and efficiency of our present developments. As a case in point, draft animal power is often regarded as something that is only relevant to the “Developing Countries”, in other words, those whom we consider “under-developed”. And when talking about mechanization, which means replacing hand labor with machinery, this was first achieved by using machinery in conjunction with draft animal power, for instance, treadmill horse-powered stationary threshing machines (also some of these machines had hand powered versions). Later those horse-power machines replacing hand labor were adapted to tractor traction. Almost every generation is overly confident and claims to be better than the generation before. When one goes deeper into the cause or matter it appears that most of the crucial developments in agriculture have an older history than is commonly assumed and the pivotal technologies were introduced earlier than one would think. A fuller knowledge of the past leads us to a greater respect for the generations that have come before us. We begin to marvel at what the older generations were able to achieve under different circumstances. With this in mind and from this perspective we can shine new light on the development of draft animal power. Some would even say that live draft animal power is not a step backwards—-but a step towards the future. In the Netherlands, beginning in the early 1600’s the population of the cities started to increase and with that came the demand for more food. Vegetable growing, or gardening suddenly took on a more serious character. This surge in raising produce was largely focused on a hand labor gardening culture—it was a significant agricultural movement with a lot of rapid development of new tools and systems. Different regions of the country also tended to develop their own unique customs in regards to soil management, and this led to the specialization of crop varieties, growing methods and tools. Unique words and phrases reflecting these regional developments became particular to certain districts and reflected the level of craft these farmers brought into their work. A one person farm or garden could be as large as 1.5 hectares, all work being hand labor. These small holdings were most often in the periphery of the cities where the gardeners had a ready base of customers. Many of these mini-farms were small enough that the farmer and his family could do all the work by themselves, while some were a little bigger and could justify hiring workers. The soils types were light clay or sand soils. Many fields would have canals on all sides—the quintessential landscape of the Netherlands. The bigger canals were used for transport, where small hand-powered (pole) boats could navigate. The farmers could use the canals to bring manure to the field and to “ship” the harvested crops away. First the gardeners brought their harvest to the markets in the city, later to auctions. The harvest was done in the field, stacked on the boat and the farmer went by boat to the auction. Some areas would have auctions where the farmers “drove” their small boats through with, for example, the fresh harvested white cabbages from the field beautifully stacked so the buyers could see the product on the boat as it floated by. When bringing manure to the field, the boats were unloaded with wheel barrows. To mitigate compaction, planks were laid on the ground where the wheel barrow was to be driven. These “barrow planks” or “krui planken” (as called in some regions) were put down on the field to prevent compaction, and to make the work lighter than it would be wheel-barrowing through the mud. After the job was done, the farmer would take up the planks and harrow the spots where they had been laid. The harrows they used were wooden frames with wooden or metal teeth and were pulled by one person. Next, the farmer spread the heaps of manure with a fork. After which, it was time for hand spading the field. The dirt from the first furrow was put in the wheel barrow, and later brought over to the last furrow to fill it in and make the soil even again. To avoid compaction, spading was often done by setting planks (“stap-planken” or translated “step planks”) next to the furrow to walk on as one worked. One plank would be next to the furrow and a second plank lying next to first plank but on the yet to be turned soil. While spading you walk on the first plank and after finishing another furrow, you move that plank behind the second plank and continue on that way. When this job was done, it was time to harrow the field with the same hand-pulled implement described above. As another safeguard against compaction, the farmer would affix planks to the bottoms of their traditional Dutch wooden shoes. Also when they were seeding or performing other jobs for preparing the soil or working in between the young plants, these wooden shoes with planks attached were used. This method also makes the work lighter as one does not “sink” as much in the loose soil, much like walking on snow with snow shoes. These wooden shoes with planks where also used for other purposes, as when hand planting the potatoes, one makes the wholes with a hand tool, then a person follows dropping the potato in the hole, and the third person walks on wooden shoes with planks to compress the soil over the planting holes—effectively closing the holes while stepping. And again, these wooden shoes with planks were used on a freshly spaded soil, which was carefully stepped over while preparing a seedbed. Something similar was also done with the use of horses in low swampy pastures, where a working horse easily sinks in the sodden ground. In many places in the Netherlands the water table tends to be quite near the surface. For getting hay in or for any other reason to be in a wet field with a horse and wagon, square planks were attached underneath the back hooves of the horse. These “horse boards” (called “hynsteboerd” or “trippen” in the Frisian language), fitted to be a bit wider and longer than the horse’s hoof, were at first made out of wood (oak or ash) and later also of metal. These planks were attached underneath the back hooves since the rear legs are where the driving power of the horse originates. On the wettest fields all four legs would be “boarded” in this fashion. If one observes a horse walking on freshly turned soil in good tilth it becomes clear that even horses can do damage to the soil. Horses don’t have “golden hooves” and can damage the soil structure badly when used at the wrong time. I had direct experience of these same spading and planting systems where they were used for planting in a green house. In this case, it was an autumn planting of lambs’ lettuce (mache). The wooden planting boards had squares blocks underneath them, leaving a print (of plant holes) to show where to plant after you lift the board. You begin by laying the first step-board in the plant ready soil, and then put the second board behind the first one. Then the first board is placed after the second one and you put your plants in the marked spaces. The trays with plants are placed on the board and one also kneels on it. Some growers have a rail in the greenhouse where the transplant trays can be put on the rails and moved along as you go along planting and moving the boards, other have paths and you can use to bring the trays to the boards which also limits how much you have to step on the ground. This way of planting works best with two people. When lifting the board, each person lifts on one side, carefully at the same moment lifting the board and placing it over the board they are standing on. For me the Warmonderhof Biodynamic Agricultural School was very important time in my life as it was a transition from the conventional farming I had been raised in to the organic and biodynamic world, and from the dairy culture of my family’s farm into the vegetable growing culture. This school does a good job at preparing young farmers and giving them a foundation from which to start their own small farm or agricultural business. At the Warmonderhof they teach skills in driving the tractor, hand labor, and also they present classes on working with draft animals. The students get hands on experience working with the horses. For the Netherlands, having draft animal power incorporated in one’s educational curriculum is very unique and it is a rare opportunity to get this kind of hands-on experience. On a Dutch herb farm where I worked, we also hand spaded the smaller plots. After spading it was time to level the field and to get rid of the first germinated weeds. This job could be done with a hand rake or the harrow—which was my implement of choice. A horse would not have enough space to turn on these small plots. So there I chose to “drag” the harrow myself. I could harrow these small plots faster than I could rake them, and also faster than if I had taken the time to hitch and harness a horse to do it. Then making beds and planting by hand would follow. We marked out the rows, 3 or 4 at a time, all by hand. Before using the marker we would set out a straight rope to establish the first line. For every new bed we would use the rope to keep the rows straight. The field we were planting was 3.7 acres (1.5 hectare). Even today, there are still many farms in Holland that do everything by hand. It is not uncommon to use a spade to turn the soil and follow this with a harrow that is also pulled by hand. This is in part made possible by the light nutrient rich clay soils or sandy soils that are free of stones. I would not necessarily recommend these methods, but describe them here to point out that, given how much human labor alone can accomplish, we should then consider just how much potential a single horse has in small scale farming. There are quite a few people that have a horse standing idle on their farms, which could be of great help to them in the garden. On the herb farm all the spading, cultivating and harvesting on these smaller plots was done with handwork, and the bigger fields were worked with a draft horse. Later on I had the opportunity to visit a farm in Peru, South America. 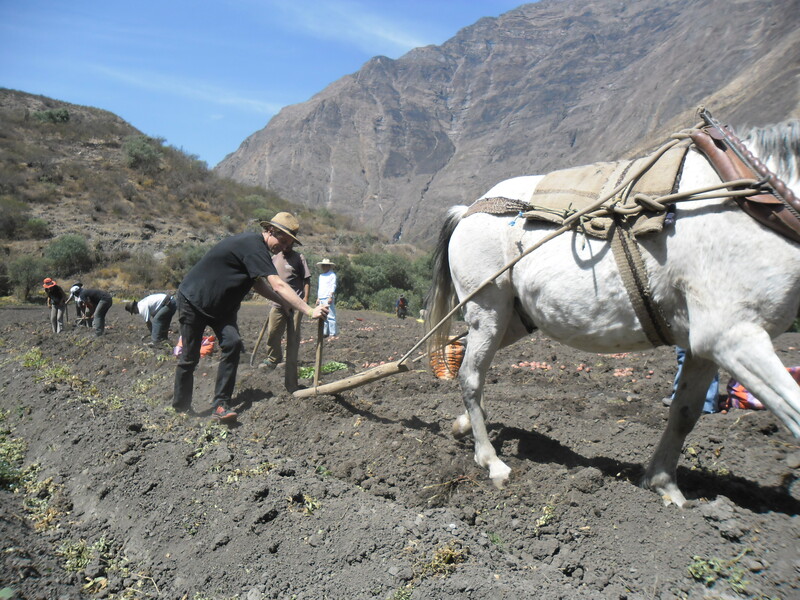 One time we wanted to seed alfalfa in a stony field of 3.5 acres located in the Andes Mountains. There the field had been irrigated (letting water from a canal over flow the whole field) a day before and two ards (a primitive type of scratch plow) and two mules (each hooked singly) were used to loosen the soil. This operation with the mules took two whole days. After that, the remaining weeds were pulled out by hand. Then we hand seeded the alfalfa. We hand raked the seeds in, with 3 people which took us 8 hours, having rakes that were about one foot in width. In that situation I would not have minded having the harrow to rake in the seeds with a mule. I also visited another Andean mountain farm, this time at Terrasana Organics in Ecuador, where 25 acres were planted in produce. The setup there was quite flexible. Terrasana Organics has 3 sources of draft power. First, a walk behind tractor, secondly, the horse, and third, the tractor. The tractor is used for the heaviest work, like for example; turning the soil with a spader (on a crank shaft to prevent hard pan) and also the disc harrow. The loosely turned soil would be hand planted and later cultivated by the horse. 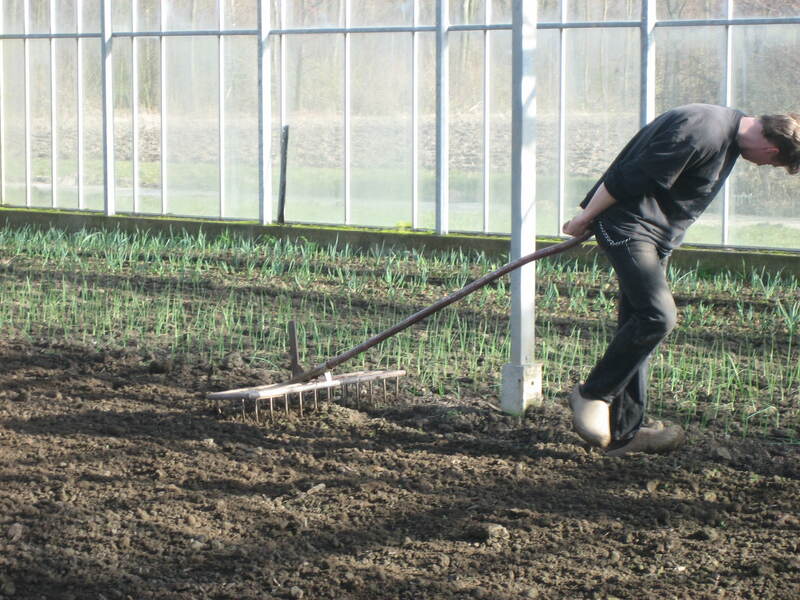 A cultivator is lighter to pull and the tractor has much more power than necessary to do this work. The horse is much better suited for the cultivation work, and for the growing crops there is less soil compaction. Using the horse to cultivate means more soil pores remain open and this preserves and stimulates an active soil life. To be organic means you have to cultivate more than the conventional farmer who can resort to spraying herbicides. If you have less compaction while cultivating this will enhance the growth of your crops. The other draft source at Terrasana was the walk behind tractor which was used with a cart hitched to it to pick up and bring in the year-round weekly harvest. On this farm, having each draft source working at what it does best works well. Having these different draft sources in place allowed the farm to be more flexible because each power source can be operated at the same time. The tractor operator would prepare the soil, while the horse “driver/operator” was cultivating—all of which gets more work done at once in an efficient way (and within the window when the weather and soil circumstances lend themselves to do the work). When I visited among Amish farmers, I got acquainted with their methods in using draft animal power. The utilization of these draft-power source keeps their farms smaller and sets a certain pace and scale. It also fosters a lively and interactive sense of community among them. It was quite impressive and valuable for me to experience such a strong and tight-knit community. Compared to dairy farming, growing produce is quite a new thing among the Amish. Given my own background in market gardening there were not a lot of new things that I observed in terms of their growing methods. I was surprised by the extensive use of plastic mulch, since I come from a culture that doesn’t use this at all. We focus on weed control principally through the use two different models of hand hoes (on a long handle) to hoe in the row. I do remember the experience of harvesting with nobody holding the lines of the team, which was hitched to a wagon. One person harvested cabbages and threw them to the person stacking them on the wagon as the horses stood patiently waiting. This was also done in Holland, for example when harvesting cauliflower, when it was time for the horse to step up, the farmer would knock with the harvesting knife on the wagon, and then to stop just say; “Whoa”. In the agricultural methods that the Amish practice, I observed the use of motorized power mounted on horse drawn machinery. The horses or mules pull the machine and the engine drives the PTO (power-take-off system). With a relatively small engine, modern small tractor machinery can be used behind a team of draft horses or mules. 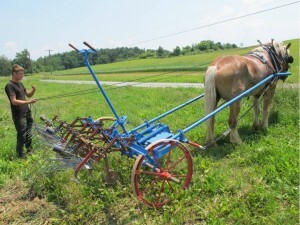 This has allowed those groups who permit it to use tractor machinery behind horses and work with a more modern method (all aspects of Amish life are dictated by a list of written or oral codes of behavior, known as Ordnung, which outline the basics practices of the faith and help to define what it means to be a member of the church community—the Ordnung are not uniform among all the Amish, as they are decided upon by local churches—for instance, some communities allow the use of horse-drawn motorized equipment while others stick with ground-driven implements only). When the first wave of horse drawn machinery industry was at its peak in the early part of the 20th century, just as some of the Amish manufacturers do now, there were engines used on some of the machinery. For instance, in Europe a mower with an engine mount was developed which enabled the farmer to hitch just one horse on the motorized mower, using the same mowing width that was formerly done with a team (and with less or no clogging of the sickle bar). So it is obvious to see that the second wave of the horse machinery industry (happening right now)—which is fueled mainly by Amish machine shops—continues in these footsteps of incorporating motorized components into horse drawn implements. However, at the same time Amish manufacturers are also developing innovative ground-driven machinery with new lines of smart improved “re-inventions” of the older mid-20th century models. One of these re-inventions is on the new two-bottom plow from White Horse Machinery. The lifting system of this plow (without having a 3-point hitch as on a tractor) is made simple for the driver; all one has to do to lift the plow is pull on a rope. This activates a mechanism that can lift and lower the plow in and out of transport position, all of which makes plow very light, easy and safe to operate, similar to the old dump rakes, where you just step on a peddle and the machine goes in and out of engagement. I know I would enjoy having such a mechanism on a riding plow or riding cultivator. We can be sure that developments like these will continue. Whatever the power source for traction on the farm, with small scale vegetable production there is always a lot of handwork involved. How much percentage of the work could or should be hand work? Even on small scale operations that use tractors, and on horse-powered farms, hand work is usually a very big percentage when you think of weeding, harvesting and packaging. In terms of making our small-scale produce farms as efficient as possible, the question we should be asking ourselves is; which parts of this (hand) work does it make sense to replace the human labor with a greater power source—whether it be by draft animal or tractor, or some combination of the two? As we have seen in these few examples I have given there are many ways to achieve the same goal. When it comes to growing produce, I want to look at the various means there are to get to the desired end of an efficient and profitable farm in the most resilient and replicable way. To me working with horses signifies the relationships of working and being together with the living things around us, which I have come to value deeply. Like when one can see the soil, plant and animals not just for their exterior shells, but with a vision that penetrates surface appearances and perceives some aspects of the inner workings of things and how everything that lives is connected. By working with horses and understanding what that takes I have become more aware of seeing inside the horse and the inner connection that exists between me and the horse. In order for it to really work, the relationship between human and horse cannot remain superficial. In a certain similar way one can have a relationship with the soil, plants and other animal life of the farm. Humans focus a lot on humans. I like machinery and am intrigued by how it works, but working with a horse shifts me over to another pace and touches or moves me to be more aware of my surroundings and with what I’m doing and with what I want to be doing. I don’t know how to put it into words any better than that…but it feels like a revelation.